Seafood Bringhe Valenciana. Traditionally paella or valenciana is served at our Noche Buena every year. The blog is now about 2 1/2 years and I also made as a tradition to post those Noche Buena paella dish whether it’s arroz, valenciana or bringhe. Last year it was my own seafood paella and the year before it was the rice cooker version of seafood paella. For this year’s Noche Buena I made a Seafood Bringhe Valenciana. It’s a medley of crabs, clams, mussels, squids and fish fillet. To make the dish I used one part glutinous rice and one part regular rice sautéed in garlic, ginger and onions. In addition to the usual chorizo, I also used bacon, fried till crisp and added to the sautéed rice for added flavours. The rice is then boiled with the broth from pre-cooking the seafoods and pure coconut milk in a large pot. It is simmered until most of the liquid is absorbed by the rice before transpering in a large wok lined with banana leaves. It is then cooked to low heat until the coconut renders oil and the kitchen is filled with the sweet aroma of coconut oil and banana leaves. It is then served topped with boiled eggs. At this point I want to take this opportunity to greet every one especially to my regular readers who keep coming back all these years to check for new post, new dish and new recipe or just simply want to browse the archives. 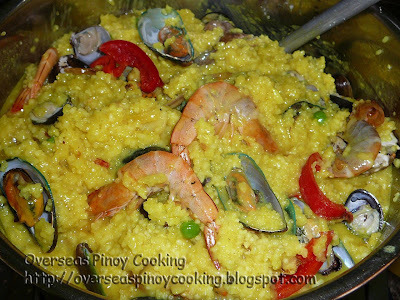 Here is how I made my “Seafood Bringhe Valenciana”. Wash clams and mussels, place in a container with lid, cover with water and replace lid, let sit for several hours (entire day) to allow the clams and mussels to expel sand and discard sea water, change water frequently and wash and drain. Put the clams and mussels in a large pan, add in 1 cup of water let boil and stirring occasionally until all the shells have open, remove from heat. Separate the clams and mussels from the broth, using a sieve strain broth of scum and sand if any, reserve the broth. Separate and discard the top empty shell and shells that did not open, keep aside. Boil crabs in 1 cup of water until color changes to red, reserve the broth, keep aside. Wash glutinous and regular rice, soak for at least an hour, and keep aside. In a pot heat oil and stir cook chorizo and bacon until crisp, add in garlic, ginger and onion, sauté for 1 to 2 minutes. Add in turmeric powder, bay leaf and fish sauce, stir cook for another minute. Add in the drained glutinous and regular rice, stir cook for 2 to 3 minutes or until the oil is infused to the rice. Add the 2 cups of broth from boiling the seafoods and the coconut milk bring to a boil and simmer for 2 to 3 minutes stirring occasionally, add more water if required. Add in the grabs, shrimp, clams, mussels, bell pepper, raisins and green peas let simmer until most of the liquid is absorbed by the rice. Now transfer the half-cocked rice in a large wok lined with banana leaves. Flatten the rice into a mound add on top the squid and fish fillet, cover with banana leaf then with the lid. Set the stove heat to the lowest possible setting and steam cook for 30 to 45 minutes. When done serve in a platter garnish with quartered egg.